There are some great updates on Hidden By Order, with several major media groups, online communities and even major publishers now interested in helping to spread what is fast becoming a best seller. People are amazed by the book and the depth it covers. Make sure you get your copy today. During my journey I was shown the secrets of the Knights Templars. The Knights Templar is an organisation dedicated to fraternal friendship based on honour and integrity. 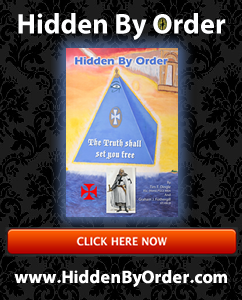 The Knights Templars are guardians of many secrets, including the Holy Grail. In the 12th Century, the Knights Templar would meditate twice a day and before battle, to focus their mind and spirit as one. The Knights Templar used sacred geometry and symbols in their ceremonies and rituals, and believed in the brotherhood of mankind. Fraternal Friendship is their Code of Life. The Knights Templar of Britannia today live by the same spiritual code of Honour. ALL NATIONALITIES are most welcome to join online, Men and Women Worldwide, as a Knight Chevalier, Executive or Official Member. Hidden By Order is the exciting new book being released on the first of December 2011 by authors Tim T. Dingle and Graham J. Fothergill.